Future of Sourcing publishes the latest content for opinion-formers and decision-makers at the heart of the global sourcing community. Authors are thought leaders in the global sourcing community and provide innovative, cutting-edge insight on challenges and opportunities in the industry today. Originally launched as Outsource Magazine in 2005, the digital publication has been re-branded to reflect the innovations in the industry and celebrate those who are leading the change. A Future of Sourcing author has deep knowledge of procurement, sourcing, supply chain and/or outsourcing trends, strategies and objectives. These individuals tend to be leaders and innovators in their fields. They are working to advance the industry, build knowledge networks and have been qualified to present their insights through a peer-review process. 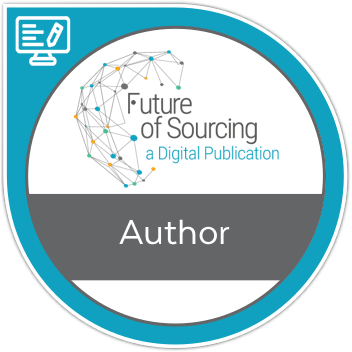 If you are interested in becoming a Future of Sourcing contributor, please reach out to Hailey Corr at hcorr@futureofsourcing.com. Interested in reading the latest article from this author? Click here.